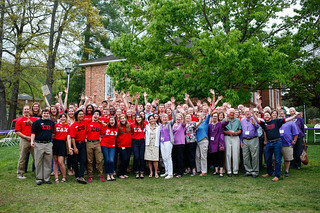 Alumni returned to the Enchanted Valley for Alumni Weekend 2017 to reconnect with the classmates, friends, and faculty that made YHC your home away from home. Fun Fact: Blackmon was inducted into YHC’s Hall of Fame in 2014 along with his good friend and fellow MLB player, Cory Gearrin, ’06, of the Atlanta Braves. All beds are XL Twins. No linens or towels are provided. The Village kitchens include a stove, dishwasher and refrigerator. No microwave or coffee pot is provided. All payments must be made in advance by a single credit card. We are not able to split charges between guests at this time. Keys may be picked up between 4–8 p.m. on Friday, June 7. Keys must be returned by 10 a.m. on Sunday, June 9. Rooms must be left in the condition they were found. Any trash must be bagged and left just outside the door. Charges for excessive cleaning and/or damage will be applied to the credit card on file. We are also offering RV and camper spaces. RV and camper lots will be located at the YHC Art Annex and upper lot behind Appleby Center. Cost is $100 for Friday and Saturday nights with a two-night minimum. There is a limited number of spots, and pre-registration is required. There are no hook-ups or dump stations available. Your RV or camper lot and space number will be emailed to you prior to the event. RVs and campers must leave the premises by Sunday, June 9 at 10 a.m. Complete the registration form below to reserve accommodations on campus.